J Transl Med. 2007 Jun 27;5:30. Autism spectrum disorders (ASD) are a group of neurodevelopmental conditions whose incidence is reaching epidemic proportions, afflicting approximately 1 in 166 children. Autistic disorder, or autism is the most common form of ASD. Although several neurophysiological alterations have been associated with autism, immune abnormalities and neural hypoperfusion appear to be broadly consistent. These appear to be causative since correlation of altered inflammatory responses, and hypoperfusion with symptology is reported. Mesenchymal stem cells (MSC) are in late phases of clinical development for treatment of graft versus host disease and Crohn’s Disease, two conditions of immune dysregulation. Cord blood CD34+ cells are known to be potent angiogenic stimulators, having demonstrated positive effects in not only peripheral ischemia, but also in models of cerebral ischemia. Additionally, anecdotal clinical cases have reported responses in autistic children receiving cord blood CD34+ cells. 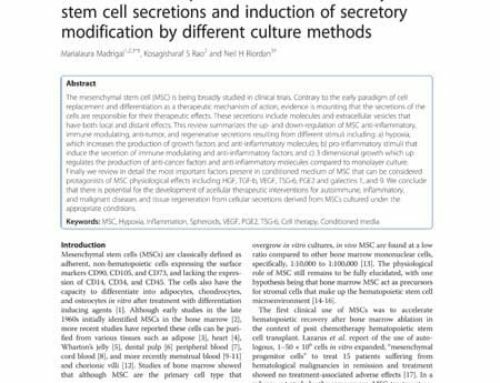 We propose the combined use of MSC and cord blood CD34+cells may be useful in the treatment of autism.